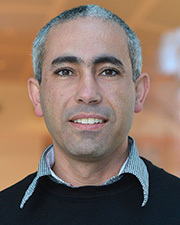 March 7, 2019 — The KC Jewish Chronicle published an article interviewing Assistant Professor in Jewish Studies, Dr. Rami Zeedan, about the upcoming elections in Israel. December 6, 2018 — Click above to read the Kansas City Jewish Chronicle's article in conversation with newly appointed Assistant Professor of Jewish Studies, Dr. Rami Zeedan. October 11, 2018 — The Kansas City Jewish Chronicle published the article, "Israeli author to speak at KU Jewish Studies writing workshop"
August 8, 2018 — Prof. Rami Zeedan interviewed by The Times of Israel for article called "Druze revolt: Why a tiny, loyal community is so infuriated by nation-state law"
September 7, 2017 — KU Jewish Studies was ranked 132 out of a total of 171 programs in the first-ever College Guide in The Forward. August 3, 2017 — Jewish Studies major Paige Krug writes first-hand about her study abroad experience in Israel. May 25, 2017 — Click the link above to read a touching article by KU student Abby Chargo on her recent study abroad experience in Israel. April 27, 2017 — Dr. Gal Levy, former Visiting Israeli Professor at KU, has won first prize for best article in Hebrew from the Israeli Political Science Association. March 28, 2017 — Each semester the members of Pi Beta Phi honor one professor for outstanding dedication, compassion and enthusiasm in the classroom with the Fraser Award. March 16, 2017 — Jewish Studies students Mackenzie Haun, Sarah Herman and Ariel Silverman were elected to join Phi Beta Kappa, the oldest and most prestigious national academic academy. December 1, 2016 — Dr. Eric Welch, Visiting Assistant Professor in Jewish Studies, is featured in the "Day in the Life' section of the University Daily Kansan. October 27, 2016 — Two news articles are featured in The Kansas City Jewish Chronicle: Dr.
October 13, 2016 — The Kansas City Jewish Chronicle introduces Cantor Benjamin Matis, newly appointed Lecturer in Jewish Studies. August 23, 2016 — This article covers recent findings from the excavation site in Gath, Israel, where Visiting Assistant Professor Dr. Eric Welch leads a study abroad program. March 10, 2016 — Click on the link above to view this article in The University Daily Kansan regarding Consul General of the Midwest, Roey Gilad's visit to campus on March 9. March 4, 2016 — Dr. Eric Welch's archaeological dig is featured in the 2016 KU Chancellor's Report. January 21, 2016 — Click the link above to read in the Kansas City Jewish Chronicle about a donation from KU alum Harvey Bodker that will be used to fund scholarships to help students study in Israel. December 21, 2015 — Please click on the link above to view KU's best moments from 2015 and read about the new major in Jewish Studies and the archaeological dig in Israel this past summer. December 4, 2015 — Click on the above link to read an interview with Dr. Eric Welch, Visiting Assistant Professor of Jewish Studies, featured by the KU Center for Undergraduate Research. October 22, 2015 — The Kansas City Jewish Chronicle reports on the approval of the new Jewish Studies major. September 25, 2015 — Click the link above to view coverage by Channel 6 News on the new Jewish Studies major. September 22, 2015 — Click on the link above to read this article in UDK! August 20, 2015 — Click the link above to read this article in The Wichita Eagle. May 28, 2015 — Click the link above to read this article published in the Kansas City Jewish Chronicle. Click here to view an archive of past news articles and program updates.